A cult movie all the way! This magnificent work is an admirable evidence of the multiple possibilities of facing the elusive character of the truth is what it beats you more. We have a Spanish Jesuit in search of conversion; on the other side of the coin we have a hunter slave whose nasty behavior is an act of instinctive reject. But as I told you previously, the truth is a capricious lover. When Spain decides sell the colony to Portugal this mercenary fights bravely against the common aggressor, and then suddenly we tend to accept him. This fabulous picture, far beyond its intrinsic virtues, such as memorable photography, superb cast and splendid edition work focuses around the unevenness of the so well know absolute statements. Who is the bad guy and who is the good guy? Is the human justice or divine justice which must prevail at the end of this dispute? Are you able to accept the violence in name of God and reject another kind of violence, because of the truth must impose, but what truth: yours or the enemy `s true? Admirable film that still remains shining with radiant energy. This movie is one of the few movies that demostrates what God is asking from each of us. To love one another. Still today politics is so far more important..so they think it is. This movie is accurate for showing the culture of the Jesuits, for example; their lack of material possessions. The Jesuits taught a great example of repentance in the way which Mendoza took upon himself the task of carrying a bag of armor up the mountain to be forgiven and receive the privilege of being a Jesuit. Altamirano`s way of teaching was through love. He showed that the culture and ways of the Guarani was not important to receive the message which he carried. He wasn't willing to fight against the government because they were his brothers. He had such a love for his church that he was not going to break the laws of the Jesuits and fight. He was killed as a priest, showing his faithfulness to God. This movie portrays the misuse of government power. Governments are to serve the people. The people of the Church have to follow the counsel of the Government. In some cases it`s appropriate for church to resist the government. A great conflict in many countries, as shown in this movie, was the governments lies, and misuse of power to obtain what they wanted; control over the church. The movie developed very slowly. It took a while to build up the characters and theme to show the plot. The themes shown in this movie were: love of man, wars between church and government, and religious protection. The actors of this film did a great job of portraying the emotions of the Jesuits, Guarani, and government officials. When the Guarani child sings you can see: the fear in the Guarani's faces, anger of governmental officials, and peacemaking of the Jesuits. A striking scene is when the Guarani mothers were forced to abandon their children. Great Movie That Moved Me Personally! The Sign of a Classic! This movie moved me (no pun intended) on a number of levels as its theme of hypocrisy, greed, betrayal and the inhumanity and cruelty of man hits home hard and yet I couldn't help but feel that it was a little too short at just a little over 2 hours long. Perhaps this film too was a victim of commercial factors and that it was edited to this time frame but if ever a film would be better off for being longer it would have to be this one. I felt the characters didn't have time to develop enough and that this fine wine didn't get to breathe before we were forced to drink it. I felt DeNiro's story at the beginning and his character could have benefitted from some development and I would have liked to have seen more of the everyday life of the tribe and their spiritual development. For this reason, I hope a good Director's Cut Blu-ray version is released soon as this movie if given the chance to slowly unravel has the potential to be at least as good as "Lawrence of Arabia". This doesn't mean that this is a bad film in any way but it certainly could have been at least a little bit better. In fact it is a testimony to how good this film is in that I'm actually asking for it to be at least 3 hours long instead of wishing the running length to be shorter as I do for many other films. As someone from Portuguese/Asian descent who is also Catholic; this film moved me greatly as it reminded me of how imperfect some of my ancestors both of descent and of faith were and I was actually very sad by many of the scenes. The fact that Portugal still allowed slavery even after Spain "abolished" it sickens me and the fact that the Church had so little faith in their beliefs to engage tragically in the politics of the time to totally pervert Christ's teachings leaves me also with great disappointment. The Cardinal's inexplicable decision to not protect the innocent and Christ's little innocent ones from effectively what became Satan's minions showed his great lack of faith in the very religion he professes to follow. His misplaced concern that the Jesuits would be wiped out of existance as being a worthy reason to commit a gross sin of omission and allow genocide for greed sickened me. If it was God's will to protect the Jesuits, nothing would have threatened them and all they needed to do was to do the simple command of Jesus to go forth and spread the Gospel to the ends of the earth. Jeremy Irons does this to the bitter end and hence imitates Christ the best while everyone else ironically does the opposite and does Satan's work in the name of Christ. I found the scene where even the Blessed Sacrament is shot at to be the most touching as "followers" of Christ actually shoot at Him. This film will stay with me for a long time as I ponder the many aspects over time. This dvd is very well put together as well as I really like the mostly cardboard packaging and the bonus dvd is a real treat describing the making of the film as well as highlighting how natives in South America are still being abused and exploited to this day. The picture quality is very good and so is the sound quality although I would repeat that a longer, Director's Cut version restored both picture and sound-wise in Blu-ray would be a real treat. With the 25th anniversary of the film due in a couple of years time, this would be a good opportunity to do such a project. The way in which The Mission, which is set c. 1750, integrates the life of Rodrigo Mendoza, a former capturer of indigenous people for the slave trade, to the lives of Jesuit missionaries and the lives of the indigenous people of Argentina, Paraguay, and Brazil is absolutely amazing. I would like to focus on the issue of the indigenous culture of South America that is portrayed in the film-the Guarani Indians. I feel that the lenses through which the indigenous people are viewed in the film are realistic, as you can say. There are, basically, two perspectives on the indigenous people in the film. The first perspective views the indigenous people as "animals." This perspective is held by Don Cabeza and by other representatives that back up Spain's and Portugal's intentions to take over the land of the indigenous, as well as to enslave them. The second perspective is shared by Father Gabriel, Rodrigo (who, ironically, has become a Jesuit and, therefore, serves the interests of the indigenous people), and the other Jesuit missionaries; this perspective views the indigenous people as valuable human beings with rights. The relationship among the indigenous community and the Europeans begins by being hostile, for the first Christian priest to arrive to the area is murdered. However, Father Gabriel accomplishes to win the love and trust of the indigenous people. The role that religion plays in the film is extremely important. The indigenous people come to believe the word of the Jesuits-that is, that it is God's will for them to abandon the jungle and build a mission. Their convictions grow to be so strong that later, when the Cardinal, who professes to speak for Portugal's king and for the Catholic Church, insists that it is crucial for them to abandon the mission, the Guarani leader opposes to do so and, instead, fights back. Other aspects, regarding the relationship among the Europeans and the indigenous people, that stand out in the video are the indigenous people's adoption of European religious rituals, beliefs and daily life practices, the role that language plays, and lastly, the issue of power among the oppressing entities of politics and religion. In conclusion, I definitely recommend The Mission. It is one of the most compelling videos that I have ever watched, and what is most compelling about it is that its historical aspect is actually based on facts. It brings up the following ideas: What does it mean to be a human being? Who has the right to determine what a human being's rights are? How can men be capable of being so selfish, inhumane and cruel to other human beings, yet they are also capable of being so loving and altruistic in such a way that they are willing to give up their lives for others? La pel¨ªcula, La Misi¨®n, fue muy fuerte y triste a la vez. Los eventos de la pel¨ªcula son verdaderos y ocurrieron en Am¨¦rica del Sur en el a?o 1750, en las fronteras entre Argentina, Paraguay, y Brasil. La pel¨ªcula empieza con una escena de un sacerdote jesuita de m¨¢rtir encima de una cruz. Las ind¨ªgenas guaran¨ªes lo pusieron en el ri¨® y en poco tiempo cay¨® de una cascada grand¨ªsimo. Cuando el jefe de la iglesia o¨ªa de este, mand¨® otras jesuitas al pueblo donde la jesuita de la primera escena fue matada. Una de las jesuitas, Padre Gabriel, se aventur¨® a la selva y pudo convertir a las ind¨ªgenas al cristianismo. Por un tiempo las ind¨ªgenas viv¨ªan en paz, pero finalmente los mercenarios y comerciantes de esclavos vino. Entre ellos fue Rodrigo Mendoza. Rodrigo estaba enamorado de Carlotta, una mujer de su ciudad. ¨¦l pensaba que ella estaba enamorada de ¨¦l, pero en realidad ella estaba enamorada del hermano de Rodrigo, Felipe. Ella le dijo esto a Rodrigo y ¨¦l se puso enojado. Fue loco cuando cogi¨® a Felipe y Carlotta haciendo el amor. Despu¨¦s de atraparles, Rodrigo mat¨® a su hermano. Despu¨¦s de la muerte de su hermano, ten¨ªa remordimientos de conciencia. ¨¦l se puso deprimido y no pudo hacer nada. Padre Gabriel se encontr¨® con Rodrigo y los dos pensaban de caminos en que Rodrigo podr¨ªa compensar de su pecado. Padre Gabriel trajo a Rodrigo a su misi¨®n a San Carlos y en el camino Rodrigo llev¨® una bolsa de armadura pesada arriba de una monta?a. En tiempo, Rodrigo convirti¨® al cristianismo y se puso un sacerdote jesuita. ¨¦l ayud¨® construir y mejorar la misi¨®n de San Carlos. Hab¨ªa pocos cambios de los territorios portugueses y espa?oles. Un cambio, la misi¨®n San Carlos estaba el territorio de los portugueses en vez de los espa?oles. El jefe de la iglesia visit¨® a unas de las misiones y decidi¨® que las misiones no estar¨¢n protegidas de la iglesia espa?ol porque ahora est¨¢n en el territorio de los portugueses. Los portugueses quer¨ªan que las ind¨ªgenas regresar a la selva y dejar de la misi¨®n. Las ind¨ªgenas no entendieron por que ten¨ªan que dejar de su hogar. Decidieron que no dejar¨¢n sin luchando. Esta pel¨ªcula me pongo muy enojada y triste. Quer¨ªa llorar. Cuando realic¨¦ la realidad que cosas como ocurrieron en la pel¨ªcula todav¨ªa ocurren hoy me pongo furiosa. La pel¨ªcula me hizo odiar seres humanos. No entiendo por que unos piensan que son m¨¢s importantes y mejores que otras personas. Fue dif¨ªcil para yo ver el maltrato de las ind¨ªgenas. Por la otra mano, me gustaba el cambio que ocurri¨® en Rodrigo - fue como noche a d¨ªa. Este es un testimonio del poder de Dios. Recomendar¨ªa esta pel¨ªcula con certeza. 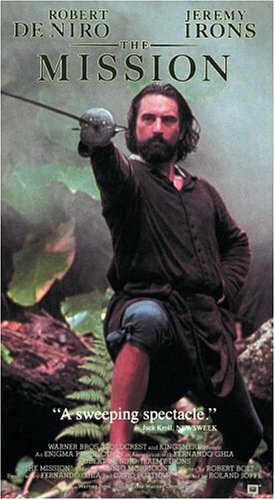 Saw "The Mission" years ago, when it first hit the movie theaters. Was much impressed then with the acting, the story, the music, and the message. After all these years I still consider "The Mission" to be one of the best films I've ever seen. The year is about 1750. The location is the middle of South America; in a rain forest in Paraguay. It is Father Gabriel's funeral. The Indians put Father Gabriel's body, strapped to a cross, in the river and push it over the waterfall. This is the opening scene of the movie, The Mission, a story of colonialization. The movie flashes back to before Father Gabriel's death. Father Gabriel, a Jesuit played by Jeremy Irons, is in the rain forest jungle, playing the flute. The Indians from the Guarini tribe, hearing the flute, come and gather around him. One Indians takes the flute and breaks it. Father Gabriel tries to fix the flute but it can't be repaired. Another Indian, who Captain Rodrigo Mendoza, a slave trader played by Robert De Niro, shoots, is caught in a trap. Father Gabriel gets angry at Rodrigo. Rodrigo brings the Indians into the town. A girl, Carlotta, tells Rodrigo that she loves Felipe, Rodrigo's brother, and this causes Rodrigo to be sad because he loves the girl and angry because the girl he loves loves his brother. The next morning there is a parade and a celebration. Rodrigo comes into Felipe's bedroom and he sees Felipe and the girl in bed. Rodrigo storms out onto the street and Felipe runs after him. The two men fight until Felipe dies when Rodrigo stabs him out of his rage. A few months later, during which time Rodrigo has been in prison, Father Gabriel goes to visit Rodrigo. Father Gabriel tells him he can choose his own penance for his crime of murdering his brother. Rodrigo decides that he will drag a netful of amour and weaponry up a mountain. He does this day after day until when an Indians cuts the rope that tied Rodrigo and the net signaling to Rodrigo that he was being to hard on himself. Father Gabriel gives a book to Rodrigo, from which Rodrigo studies. After a short ceremony in the chapel, Rodrigo is declared an official Jesuit. Spain and Portugal sign the Treaty of Madrid in which Spain (where slavery has become illegal) has to give some of the Indian land to Portugal (where slavery is legal). In order to keep the Jesuits from being forced out of Portugal, the pope orders the Jesuit missions in South America to be closed. That would mean that the Indians living on the missions would be abandoned and left to be captured by the slave traders. A group of men, one of which is the emissary of the pope, and horses arrive at the mission to share this news with Father Gabriel. There is a meeting in which the future of the Indians is discusses. Rodrigo gets angry at Don Cabesa for what Don says, but the next day Rodrigo apologizes. The emissary starts off on a trip during which he will visit different missions. He sees the Indians working on the plantation farms and carving the musical instruments. One Indian priest tells the emissary that everything at his mission is shared equally in hopes that his mission will be saved. At San Carlos the emissary pronounces that all the Indians must leave the mission. The Indians don't want to and then the emissary says that is God's will for them to go back to the jungle. In response, the Indians say it was God's will that brought them out of the jungle and into the mission in the first place. Although Jesuits take a vow of pacifism, Rodrigo takes the sword when the young Indian boy offers it to him. Rodrigo knows he is the only one who can teach the Indians to defend themselves. An Indians and Rodrigo steal gunpowder from the sailors. When stealing the gunpowder, one sailor wakes up and begins to yell. To silence him, Rodrigo kills him. Rodrigo asks for Father Gabriel's, who refuses to participate in the actual act of fighting. Father Gabriel gives him his necklace with the cross on it. The Indians and Rodrigo fight the Portuguese in the forest and in canoes in the lake. The Portuguese soldiers siege the town and Rodrigo tries to detonate the cannon-type apparatus he made with the stolen gunpowder but it doesn't explode. Rodrigo is shot and as he is dying he see Father Gabriel walking calmly with the Indians while holding a gold cross. Father Gabriel is shot and falls to the ground and then Rodrigo finally dies. The town is basically destroyed and there is a great scene showing the fiery inferno of the mission and many people, both Portuguese and Indians, being killed. The movie ends with a meeting of the governor and the emissary. The emissary is not sure if he made the right the choice. The governor says, "Your eminence, thus is the world." The emissary replies " No, thus we made the world." The closing dialogue displays one of the messages of the movie- the destruction that colonialism and the slave trade caused. This is one of those beautiful movies that lets you see a reflection of your own humanity. Whether you are the slave trader, the priest, the politician, or the innocent, you will truly see a reflection of who you are in the story of this movie. That is not to say that you are going to find the meaning of life just by watching this film, but you may get a better understanding of how the many different types of people in this world interact with eachother. Please watch this movie with an open mind and an open heart. I know that I wanted to be a better human being after seeing this story. The Mission continues to be one of my all time favorite films. The sceanography of the Amazon jungle is breathtaking not only because of its vast beauty, but because of the context; Watching De Niro clamoring up the precarious falls is just one of the many images that elicits a holding of one's breath. The other major reason that I am profoundly impressed each time I watch this film is its poignant fictional representation of how the Vatican and the Catholic European monarchs of the colonial period prioritized profiteering and political intrigue over winning souls. It betrayed the innocents and sanctioned their massacre and slavery by turning away and shrugging it off with a tear(reminiscent of WWII). As any great movie elicits a strong emotional reaction from its audience, this one elicits a flood of grief and appropriately righteous indignation at the sickening atrocities and social injustices of the "civilized Christians" against a people who had no real defense against the subjugation of militarily more advanced colonizers. Here we see a fictitious yet historically accurate account of how, once again, the powers and principalities of the day will justify their own gain and security at the ex pence of others rather than doing what is right ethically and, ironically, that which is truly representative of Christianity. There are many other components of this story of which one can ponder and discuss, such as the quality of the acting of the children and the politics of the 16th and 17th century Jesuits, the early "Liberation Theologists", and martyrdom, social anthropology, ethnography and the affect on a primitive culture by exposure to another in the attempt to study it(or 'help' it), existentialism, mysticism, global politics and commerce, labor out-sourcing...just to name a few. Politics and religious ethics aside, The Mission is a gorgeous, visually rich film with what can be considered one of the best casts imaginable performing their utmost best...what more could anyone expect of a film...if it were re-released it would be among the few movies worth paying to see in theaters. Also, if it were released as a DVD it would be one of the handful of movies worth owning. A beautifully filmed, heartbreaking masterpiece! Robert De Niro is Rodrigo Mendoza, a wealthy adventurer who makes a fortune as a mid-eighteenth-century slave trader, capturing Guarani Indians in Paraguay and selling them for a huge profit to the local governor. Mendoza's life takes a turn for the worse, however, when he learns that the woman he loves, Carlotta (Cherie Lunghi), has fallen in love with his younger brother, Felipe (Aidan Quinn). And when he discovers them in bed together, he loses control and kills his brother in a swordfight. Afterwards, however, Mendoza is consumed with extreme guilt and he becomes a Jesuit postulant after meeting Father Gabriel (Jeremy Irons). But Father Gabriel, who has always cared for the natives and resented the slave traders, is at first unsure if Mendoza's desire to do penance and achieve redemption is sincere. Mendoza fianlly completes his penance after suffering many hardships, and he helps Gabriel teach the Indians about Christianity. As the years pass, Mendoza and Gabriel become close if somewhat wary companions, running the isolated mission above Iguacu Falls together while allowing each other plenty of personal space. Everything changes, though, when in 1750 Spain and Portugal sign the Treaty of Madrid, which redefines their territorial borders in the Americas. The end result of the treaty is that Spain (which has forsaken slavery) delivers the Indian land to Portugal (where slavery remains legal). To avoid the Jesuit order being expulled from Portugal, all Jesuit missions in South America are ordered closed by the Pope, which means the Indians living there will be abandoned to the slave traders. The Guarani Indians are determined to stay and fight for the mission they've come to love, and this deeply troubles Mendoza. Despite his Jesuit vow of practicing nonviolence, he knows that with his past fighting skills as a mercenary he's the only one who can teach the Guaranis to defend themselves. Gabriel also stays, but for a different reason. The end result of the inevitable battle is predictable but nevertheless is devastating to watch. The more I see this film the more I like it. First off, it has magnificent South American jungle scenery, filmed in an area that features multiple gorgeous falls. This is one of the prettiest films you will ever watch - guaranteed. "The Mission" won the Oscar for Best Cinematography in 1986 and that award was well-deserved. There is just one stunning scene after another. I can only hope it gets a sharp Blu-Ray treatment someday. Then it will really look awesome! The story is very interesting, too: a supposed true-life account what happened back in the 1700s when a few dedicated priests tried to bring Christianity to the natives. It shows what occurred when a combination of the Catholic Church and the Portugese slave-traders and politicians attempted to put a halt to their missionary. This is a drama, not an "action film," but the movie has extended violent ending, and sometimes is shocking in that finale. Jeremy Irons, as the dedicated Jesuit who heads the mission, and Robert De Niro in a surprise role as the killer slave-trader-turned-repentant priest are both excellent in their leading roles. It was interesting to see a young Liam Neeson, too. I have always found this film to be both deeply moving and sometimes irritating (not due to the film-making, however). Its a genuinely honest film and is not manipulative. It shows the human condition in all its complexity and some of the themes (and, actually, occurances) of the film are not removed to the 18th century. They are still taking place in the 21st century: the exploitation of world cultures for western economic gain. The religious aspects of the film are even more complex with no easy answers given: all the religious characters have the strengths and frailties that come with religion: seeking to love humanity while also needing to convert the "heathen." Somtimes the two ideas can come into conflict (although most religious of a certain type don't see this). The most moving--and religious--sequence in the movie (and it still gets me worked up even thinking about it) is at the conclusion of Mendoza's penence. It is the act of compassion and forgiveness on the part of the Guarani of the man who had been so evil to them that Mendoza truely experiences conversion and which brings about the outpouring of real feeling both in crying and laughing. It is a deeply religious (and human) experience of love--and the most Christian moment in the film. Did the Guarani show this love and compassion only because of the work of the Jesuits or out of some enherent quality of their society and culture? I saw this movie in the theatre when it came out, then again when the DVD first came out, then again last year. The first time I saw it I loved this movie as I did the second time. The third time I was wishing it could be edited abit more. Some scenes seemed endless. I watched it with my brother a few yrs ago and about came to blows over it. He made some very anti-Catholic remarks that hit me the wrong way. So I guess those with other eyes will each reach a different conclusion. We will be watching it soon with a friend who is an indigenous person from Bolivia. I will be very interested to see his reaction. I also watched the movie with someone from India. They knew nothing of this history. The story is touching and to me asks the question "Is pacifism or violence the answer to evil"? And it doesn't give you the answer. The scenery is truly breathtaking. I would recommend the movie but you probably need to be in the right mood to watch.